Great Looking Military Style N-2B Parka Flight Jacket Made From 100% Nylon Material. 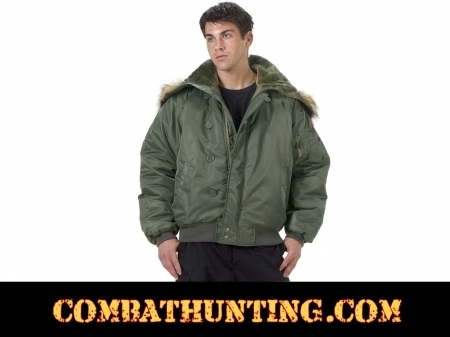 Heavy Insulated Short Waist Parka Flight Jacket Too Keep You Warm. Equipped With A Zipper Dividing. Pile-Lined Hood With Synthetic Fur Trim. Zipper Closure With Storm Flap. Hand Warmer Pockets. Left Sleeve Zipper Pocket With Pen Slots. Knit Waist And Cuffs For Comfort. Use Custom Order Button To Select Your Size.